Look closely at the taillights of the 2018 Nissan Maxima and you’ll spot the alphanumeric combination “4DSC.” It’s short for “4-Door Sports Car,” a nickname coined in the 1980s, when the Maxima was widely considered to be the poor man’s BMW. Times have changed since then. It may still wear the “4DSC” moniker, but today’s Maxima is a generously-proportioned flagship more likely to be cross shopped against other big sedans like the Toyota Avalon (which just hit showrooms as a redesigned 2019 model), Chevrolet Impala, Ford Taurus, and Dodge Charger than any BMW. It’s no sports car, but is the Maxima at least sportier than the competition? To find out, we grabbed the keys to a 2018 Maxima SV. 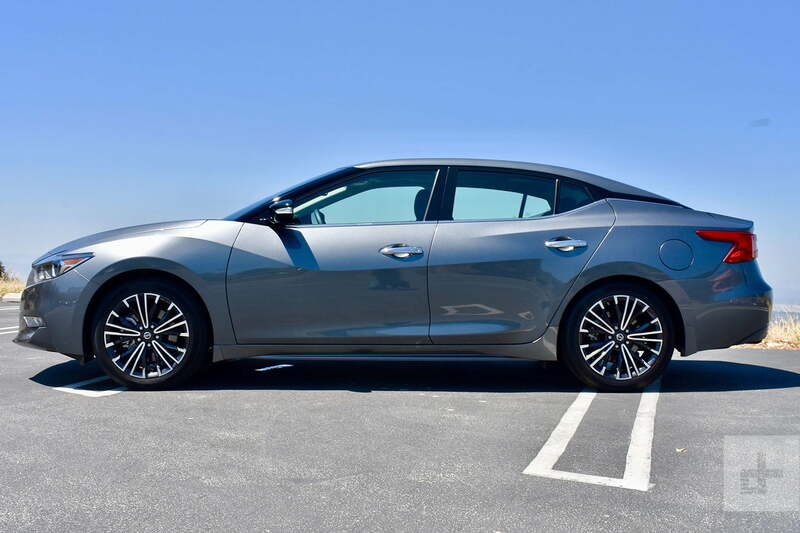 Starting at $35,270, it’s one step above the base Maxima S ($33,270) in the lineup. Nissan also offers SL, SR, and Platinum trim levels above the SV. The top-of-the-line Platinum starts at $40,940. Nissan needed to offer more space and luxurious appointments to get customers to trade up from the midsize Altima, and the Maxima doesn’t disappoint. Our SV test car was equipped with leather seats boasting neatly arranged contrast stitching. The front seats were both comfortable and supportive, offering plenty of side bolstering to keep the driver and front passenger in place during enthusiastic cornering. For 2018, the Maxima gets standard Apple CarPlay and Android Auto compatibility, with two USB ports located in front of the shifter (SL, SR, and Platinum models also get two rear USB ports). An 8.0-central touchscreen with navigation and a 7.0-inch driver information display nestled between the gauges are also standard. We found the central touchscreen to be a bit slow and were underwhelmed by the graphics on both displays. 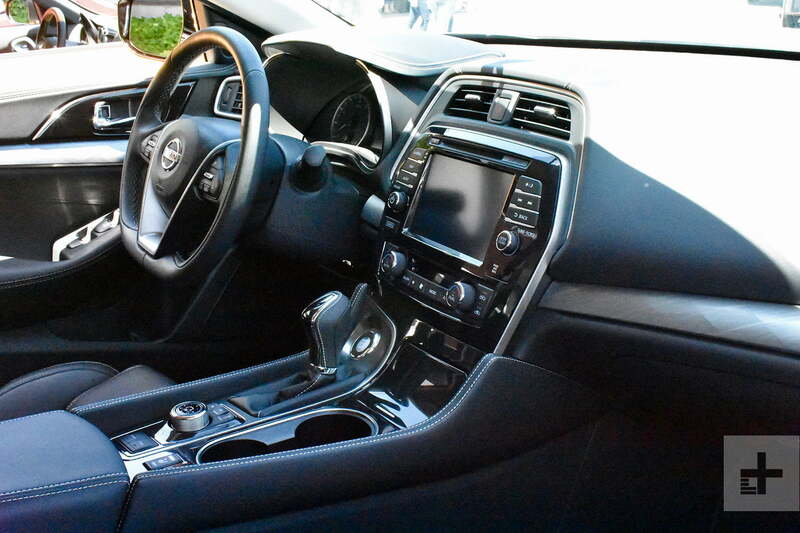 The Maxima is a big sedan, but it offers less overall interior space than most rivals’ full-size models. 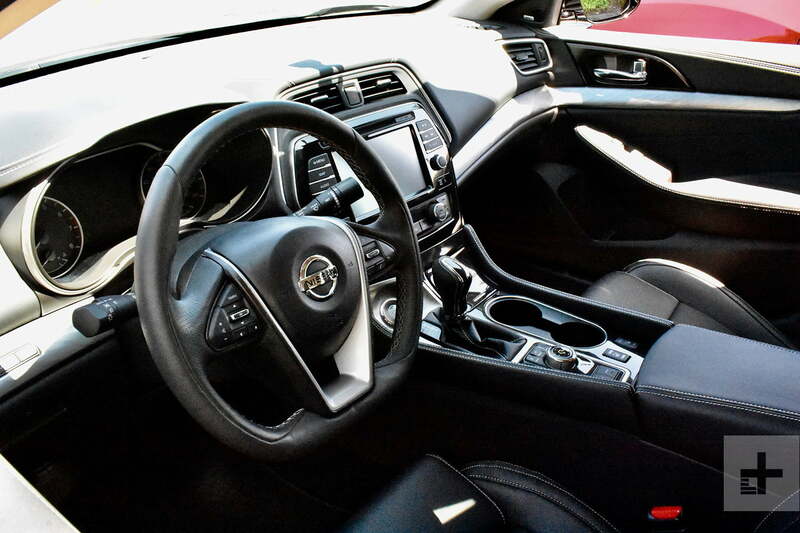 That’s not a problem when you’re sitting up front, where the Maxima offers more headroom and legroom than the Toyota Avalon, Ford Taurus, and Dodge Charger (but not as much as the Chevy Impala). However, the Maxima trails most of its rivals in rear-seat space, and a relatively narrow cabin pinches shoulder and hip room in both rows. The Maxima is great for getting over the road in a hurry, but it won’t leave a smile on your face at the end. The Nissan’s 14.3 cubic feet of trunk space is well behind other cars in the segment, although a 60/40 split-folding rear seatback allows for the accommodation of longer items. Forward collision warning and autonomous emergency braking are standard on all Maxima trim levels. SL, SR, and Platinum models also get adaptive cruise control, rear cross traffic alert, and blind spot monitoring as standard equipment. On top of that, the Platinum model gets a 360-degree camera system and Nissan’s Intelligent Driver Alertness system, which analyzes steering inputs to detect driver drowsiness, and uses audio and visual warnings to rouse them. The full-size sedan segment isn’t generally considered to be a hotbed of performance, so Nissan is making a bold claim by continuing to pitch the Maxima as a “4-Door Sports Car.” Though the Maxima fell short of full sports-car status, it still offered a bit of fun. The standard 3.5-liter V6 produces a healthy 300 horsepower and 261 pound-feet of torque and, refreshingly in this day and age, it doesn’t use turbochargers to generate that grunt. The V6 is shackled to a continuously variable transmission and front-wheel drive, however — not exactly the best recipe for performance. The Maxima holds its own in the horsepower race, but doesn’t have enough to take the lead. The Avalon also comes standard with a 3.5-liter V6, which produces nearly identical power: 301 hp and 267 lb-ft. The optional 3.6-liter V6 in the Impala (a 2.5-liter four-cylinder is standard) produces 305 hp and 264 lb-ft. Like the Maxima, both the Avalon and Impala are front-wheel drive. Nissan does offer more power than Ford for the money. A similarly priced Taurus can only muster 288 hp, while the 365-hp SHO model starts at roughly $2,000 more than the most expensive Maxima. But for just slightly more than the base price of our Maxima SV test car, you can have a rear-wheel drive Dodge Charger R/T with a 370-hp 5.7-liter Hemi V8 engine (a 3.6-liter V6 is the base engine). Both Ford and Dodge also offer the option of all-wheel drive on certain trim levels. The Maxima didn’t lose its composure when we left the highway and headed for the hills. The Nissan’s V6 power definitely came in handy when slicing through Los Angeles-area traffic, and the Maxima didn’t lose its composure when we left the highway and headed for the hills above the City of Angels. The Maxima handles twisty roads quite well for a big sedan designed with daily drivability in mind. But the car doesn’t feel very involving. The Maxima is great for getting over the road in a hurry, but it won’t leave a smile on your face at the end. When driven more economically, the EPA says the Maxima will get 25 mpg combined (21 mpg city, 30 mpg highway). That’s not bad for a car in this segment, but keep in mind that Toyota offers an Avalon hybrid model that delivers a maximum 44 mpg combined (43 mpg city, 44 mpg highway). The 2018 Nissan Maxima received a Top Safety Pick rating from the Insurance Institute for Highway Safety. It fell short of the full Top Safety Pick+ rating due to “Average” scores for headlights and child-seat anchors. The National Highway Traffic Safety Administration gave the Maxima an overall safety rating of five (out of five) stars. We’d probably stick with the same SV trim level as our test car, which covers all the bases in terms of standard equipment. Other trim levels offer more stuff, but they also bump the price closer to $40,000 and entry-level luxury car territory. We’re intrigued by the sportier suspension setup on the Maxima SR model, but since we couldn’t experience it firsthand we don’t know if it’s worth the extra money.